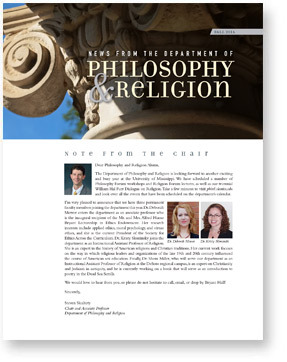 The University of Mississippi Department of Philosophy and Religion offers graduate courses leading to a master’s degree in philosophy. 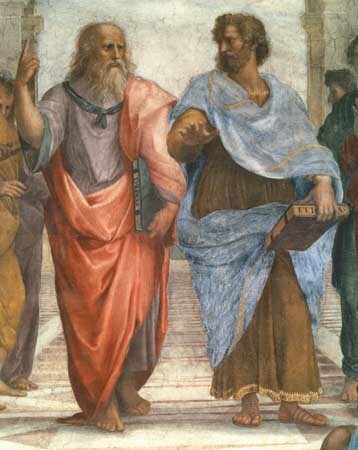 We not only serve students who have an undergraduate major in philosophy, but also those whose philosophical interests developed late as undergraduates and who need to fill in gaps in their background. The department is small enough to permit extensive student-faculty interaction while diverse enough to provide a broad, philosophical education. The Mississippi Philosophical Association, the department’s own Philosophy Forum Speakers Series, as well as several regional conferences provide additional opportunities for graduate students to engage with philosophers at a professional level. Our M.A. degree can be used as a stepping stone to a wide variety of programs and careers. Graduates from our master’s program have been admitted to Ph.D. programs in philosophy at Syracuse University, Purdue University, University of California at Irvine, University of Indiana, University of Massachusetts, University of Miami, University of Arkansas, Baylor University, Rice University, University of Illinois, University of Iowa, and King’s College. Moreover, because our program improves students’ ability to read, write, and communicate effectively, an M.A. can also serve as an excellent foundation for legal studies, education, business, or study at a theological school or seminary.